Mandy Steward's book Thrashing About with God: Finding Faith on the Other Side of Everything was released today, and i am two chapters in. i've already decided i don't need to write a memoir anymore, since she already has (don't worry, writer friends, i'm just kidding - i know MY story is important. it's just the similarities are...eerie). and God has already spoken to tender places in my heart. this book, it is connected to my story in many ways, and is beyond where i have allowed myself freedom to go, in so many ways. i had both fear and excitement before beginning its pages. 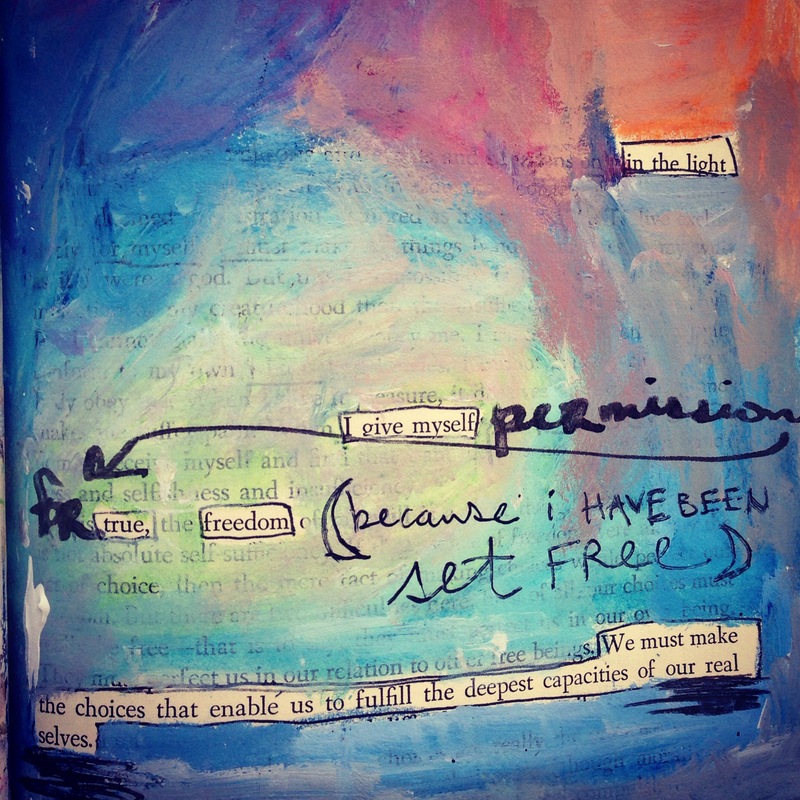 i had to write myself a "permission slip" before i read the first lines, to remind myself of freedom to thrash, unafraid of my final destination. Mandy is one of the co-creators of The Art Journaler community, where i have spent much time this past year. Each month, they send out a download for us to have prompts to work from in our art journal, or to set intention for our days. This month, October, since her book came out today, the prompts revolve around themes within her book. some of them look very dangerous at first glance (and may very well be). Last night, i cut apart the typed phrases, without paying much attention to their words. i read some, and a few made me think: "i hope i don't draw that one until later in the month, when i've read enough of the book to have context for it." This was one of those. "write your own bible", it said. Whaa...? *marking out huge chunks of the bible (yes, like IN an actual bible - gasp! it's a One-Year Bible that we have been meaning to "get rid of" and i rescued it.) to create "blackout poetry". *meditating on one word that "shimmers" from a bible passage, contemplating ripe meanings within its phrases. the spirit moves//having only ever known: alone//birth soon to be witnessed//in deep waters. 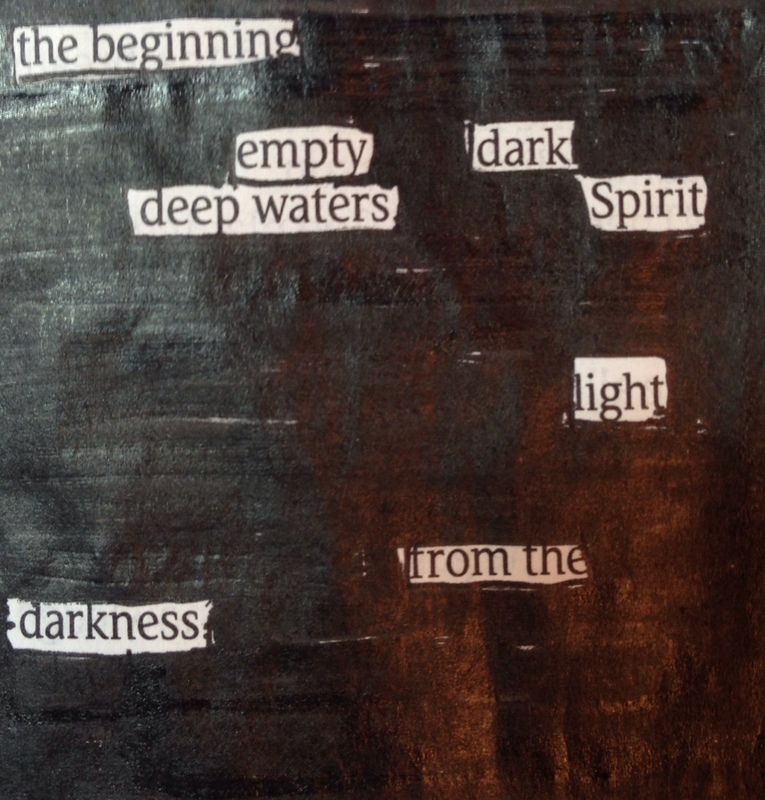 *and finally a "found poem", cut and pieced from random book pages. i have been afraid of the bible. for years. it has been a full three years since i stepped out of the darkest , most despairing time of my life (so far) into new light. and it has been beauty and freedom and spirit-whispers and desire. but the bible? it still had all the same language it did in all my growing-up years, and when i read it, it was heavy with baggage of decades of knowing all the right answers. all those "right" answers that no longer had the same meaning for me, walking in this new life. and so, i haven't spent much time in it. i have had moments of feeling guilty, like i "should" be able to read scripture without feeling so triggered back to the shame of before. but walking in freedom requires of me not to obligate myself when i am in a season of needing something different. and he has been nothing but tender, grace-full, aching with me for my heart's freedom. so there was this moment, a couple weeks ago, where a friend was teaching a workshop, and used a bible passage glued down as the base layer for what she was creating. and as i followed along, glancing here and there, making connections within the passage, i discovered that i wasn't afraid (well, maybe a little). i felt free coming to the bible for the first time in ages. granted, i chose the passage that has felt most "safe" to me - galatians 5 - i can get on board with being free, and refusing to put old chains back on, and being led by the spirit. but as i worked through it, i found myself alive (this was very unexpected), and i suddenly wanted to do this for the whole bible (a lofty goal? perhaps)...! and the friend i confessed this to said, "i would buy that book, even if i wasn't a christian anymore!!" imagine. 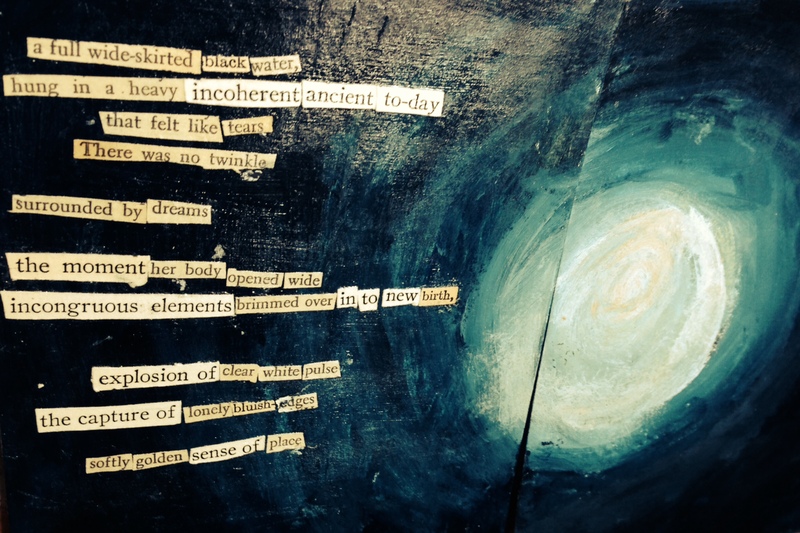 a book of art and found poetry, created as i thrash my way anew through old words? abstract reflection and interaction with ages-old text, and the heart of God? i want that book. and i have been waiting to find "my book", since i am 8 weeks into a 12-week writing course whose intent was to come out with a manuscript; but all i was writing seemed to fall flat. nothing seemed right. but this? this is me. this is my journey, moving quietly in rhythm with the spirit, no cold-hard-fact answers; only whispers and questions and creating and receiving. last week, i began in genesis, and have made it through the first four days of creation. and i have to tell you: it has been incredible. and whether or not it ends up published as an official book, this process...? it has already been invaluable and life-giving for me.